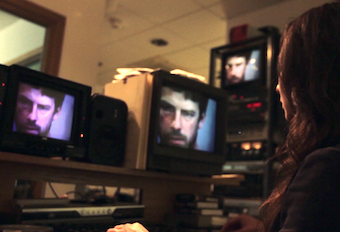 Thought Broadcasting is a film about psychosis and surveillance. A composite of fact and fiction, the film draws upon real-life accounts of a schizophrenic disorder: the belief that ones thoughts are being transmitted and heard by others. Set against the proliferation of mobile phone masts in the urban and rural landscape, the film reveals a fragmented inner world of paranoid delusions and acute anxiety, off-set by revelations of mass surveillance and data gathering by government security agencies. Filming locations include a psychiatric video recording studio, an abandoned broadcast television station, and a military base used for mass communications monitoring and interception. Part clinical observation, part psychological horror, the film is driven by a tense and dark electronic score by Lord Mongo, and interweaves the flickering detritus of analogue tape, monitors and studio cameras with layers of sampled archive voices; forming a picture of a psychotic state of mind, entangled in an interconnected world. 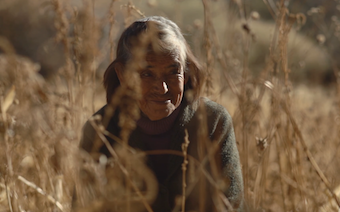 The Centaur’s Nostalgia is a reflection on the gaucho tradition narrated through the love story of an elderly couple who still lives in the forgotten hills of Northern Argentina. 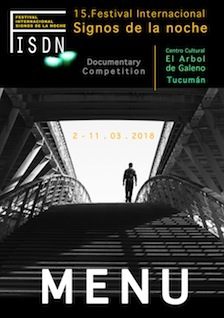 Starting with a portrait of their everyday life, the film immerses into their memories and dreams to finally find the nostalgia of what it won’t be anymore: an ancient way of human relationships, a way of living life, a world that faces an end, like a fire that burns and slowly dies in front of us.